Canon has released its third ink-efficient printer. The new Canon Pixma G4000 can print 6,000 black and white pages and 7,000 colour pages per ink set. Businesses and households alike increasingly demand print solutions that lower the cost per printed page. In addition, shopping for ink is time-consuming and the replacement process sometimes tricky. The leading inkjet printer manufacturers have therefore released high-yield printers in recent years. For example, Epson offers refillable ink tank printers, while Canon has opted for an integrated tank solution. The latest Canon Pixma G4000 is the successor to the Pixma 3000 printer with similar performance, but with additional features like fax support. Pixma G4000 prints at a resolution of 4,800 x 1,200 dpi. The printer is capable of printing 5 colour images per minutes (ipm) and 8.8 images in monochrome mode. The rear tray holds 100 sheets of paper, while the Automated Document Feeder (ADF) can feed 20 sheets for scanning and copying. 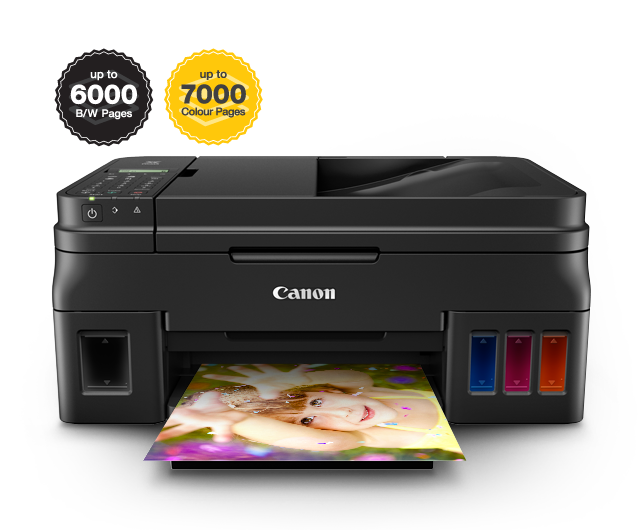 Canon Pixma G4000 is a fully-connected, wireless all-in-one printer. There are handy plugins available for the most popular devices out there including Apple AirPrint for Apple devices, Android for tablets and smartphones and Amazon for Kindle devices. Of course, Canon’s own print app is also supported as well as Google’s Cloud Print. The printer retails at about NZ$380 in Hong Kong and Singapore. Expect to pay something similar if and when it becomes available in New Zealand.